Almost every town in the coast has a market day and there will always be one close to where you live. It took me almost a year to figure out the schedules – every day of the week is a market day in a different town. 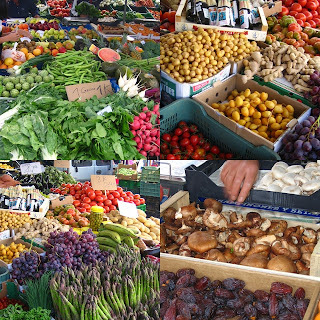 Thursdays are market days in San Pedro de Alcantara, the neighboring town to Marbella. I’ve been several times over the past year and I have my favorite stall for fruits and vegetables. The freshness and variety at the market beats the supermarket’s cling-filmed offering and the shopping experience is much more fun. Aside from fruits, vegetables and spices there are also fresh flowers and plants plus lots of other stalls selling everything under the sun – clothes, shoes, gummy bears, ceramics, cassettes etc. The best time to go is when they first open at around 9:30 a.m. before the crowds start arriving. They stay open until about 2:00 p.m. when they start to pack up and get ready for lunch and their afternoon siesta (nap). If you intend to shop for a lot, then it’s essential to invest in a roller bag. I have a navy blue Rollser and today it was filled to the brim with artichokes, cherries, avocados, small fingerling potatoes, white asparagus, thin green beans, cherry tomatoes, mandarin oranges, bananas, Fuji apples, broccoli, chilies, sweet potatoes, aubergines, carrots, red peppers, garlic, ginger, onions, parsley and basil. I also managed to squeeze in a bunch of fuchsia parrot tulips with the edges trimmed in white. All that for half what I would have spent at the supermarket. 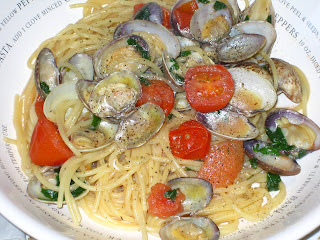 I’m going to start planning my menu for the week and for lunch I’m making Spaghetti alle vongole using the fresh parsley and cherry tomatoes I just bought.